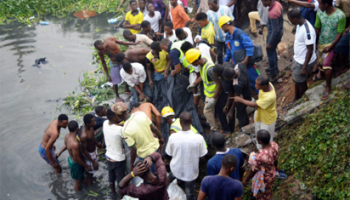 Three people have been confirmed dead, while 17 others were rescued following a boat mishap that happened on Saturday around Bayeku area of Ikorodu, Lagos State. The boat, which was carrying 20 passengers, reportedly ran into a submerged object and capzised mid-sea within the Oke-Ira Nla axis as it was heading to Bayeku area of Ikorodu at about 12:15pm on Saturday. The General Manager of the Lagos State Waterways Authority (LASWA), Mr. Damilola Emmanuel, confirmed the incident. He said that an on-the -spot investigation done by LASWA revealed that the incident was caused by a submerged object beneath the waterways. While confirming that all the passengers had their life jackets on, the LASWA General Manager noted that the casualty could have been due to fear or shock. His words: “Unfortunately, three persons were confirmed dead, while 17 persons were rescued alive. The general manager said that the spot of the submerged wreck had been marked to avoid future occurrence, while the State Government in conjunction with the Marine Police are to investigate the incident.